Midway through each year of study, Chelsea BA Fine Art students have an interim exhibition of their work. This year’s final year students are currently holding theirs at the the college, for which they were asked to “translate” their own work as a means of challenging their practice and approaching the creative process from a different perspective. We asked three of the third year students taking part, Sasha Cresdee, Vanessa Walters and Nickoleta Martjanova, to explain how they approached making their work for the show and how it can be helpful to ‘translate’ your own work. Can you explain what is meant by ‘Translation’? Sasha: It’s about thinking about other ways of producing work, while also keeping your key motivations and ideas in place. It’s not always as simple as changing the medium of the work, but more like pushing your ideas and allowing yourself to change your habitual ways of working. The third year Translation show is an opportunity to challenge your own practice. It’s definitely helpful, it gives you space to experiment and find the edges of your practice before the degree show. Making mistakes or finding something out about your work that you didn’t realise was there before, is important for progress. Do you feel that ‘translating’ you work is helpful for your practice? Vanessa: Definitely – the show is timed right so that we shake up our practice a little early on in our final year. By this point most of us have established a comfortable method of working, and the Translation show is an opportunity to put that to one side without fear! It is also helpful at this stage to understand what is crucial to our practice, so that these elements can be taken forward into new ways of working. How does this show differ from the other year group shows you’ve done in first and second year? Nikoleta: I don’t think there is much difference between interim shows, apart from our perception and awareness that our surreal journey on this ‘Degree train’ is coming to its destination. The Translation show says ‘Wake Up! You’re graduating!’, otherwise I could spend a whole year just making without being aware of time. Some of us on the course have come to conclusion that it is not the end, it is the start, the start of our careers and lives in general. I am very excited for the challenge that is ahead, but having said that I don’t think it’s just about making art after graduation – it is about being an artist, I don’t think I could separate that from myself. Interim shows are about our practice and how we are progressing in the third year as well as trying our hand at a new idea or medium. It is for that reason I have chosen to put work in the show that is still under development and in a medium that I am just starting to use. Can you explain a bit how you have gone about preparing for the Translation show? 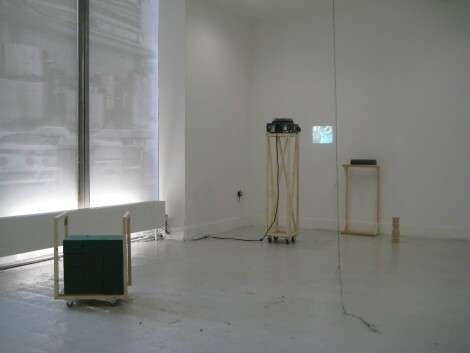 Vanessa: Previously my works were mostly wall based, spatial interventions. I wanted to continue working with my interest in spaces and display methods but to be completely unbound to the wall. This led me to work in a totally opposite way, making physical objects – mobile display platforms – which allowed for free movement within the space. 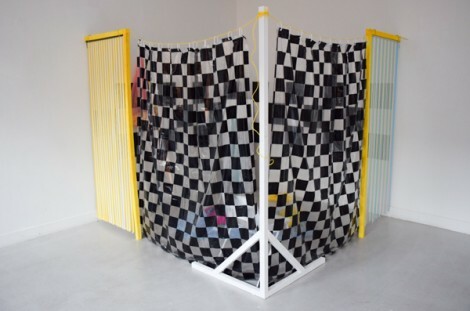 Sasha: In my studio space I’ve been making a large colourful, patterned structure that you walk into to put my installation work within, to make more of a sensory, set-like environment. I will then move the structure into the Cookhouse space for the show. Nikoleta: I have other works that are finished, and normally I like to think about the piece for a month or two before showing. But here I’m showing something that has been just made. It’s the first etching proof print I have pooled from the press last week, and I like the rawness of my feelings towards it. 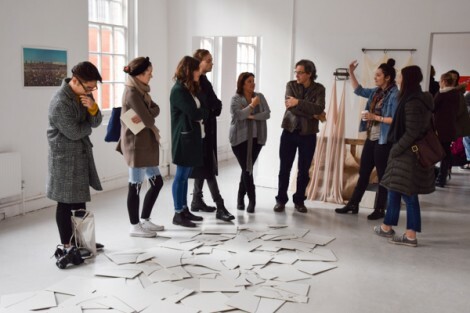 This is the third year you have been part of a year group show – do you have any advice for Chelsea first year students on how they should prepare for their interim show? Nikoleta: My advice for the first year Chelsea student is, don’t run down the stairs with your hands in your pockets. It is a good advice literally and metaphorically, you have to go and see a lot of shows, really good ones and really bad ones, because only then you’ll know the difference. Make mistakes and respond to your intuition, in my first year I hadn’t made much work, because I bought into the idea of contemporary conceptual art and in my third year I have stopped lying to myself, I don’t make anything conceptual, I make whatever I want to make and then think about why I made it later, I think that’s what being an artist is about – responding to one’s own lust for making, purely and intuitively. 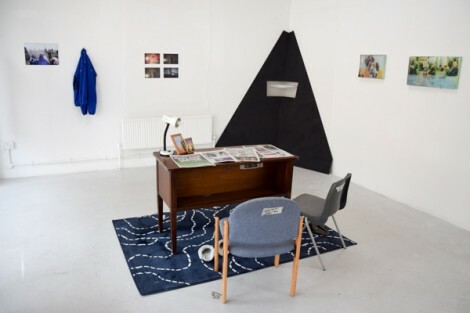 Is there any specific advice you’d offer for our first year students in how to go about curating a group show? 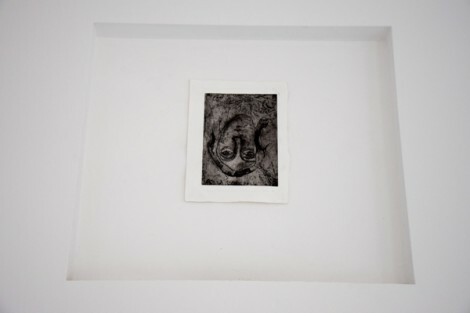 Sasha: Curating year shows is always difficult because there’s many people showing work of such variety. My advice would be communication and openness to change is key. Talk to the people in your space and figure things out as a team, you can’t curate a show on your own. Vanessa: The most important thing is continuous group discussion. It is also important that you are willing to make changes at any given point, so that the curation of the show is stronger as a whole. Finally, what’s your favourite thing about being an art student? Nikoleta: I think that my most favourite thing about being an art student is that you are suspended in time and culture with your student loan. Time doesn’t apply to you. During the first year and second year, I gradually found myself struggling for breath on sardine packed tube with people in suits, while I was proudly wearing my very own artist uniform: well fitted soiled jeans, my favourite converses, that have been passed from my oldest step sister to my youngest sister to me, and an amazing, comfy, lightweight north face down coat that I picked up in a charity shop for peanuts. I’d then only get back on the tube at seven or eight, which is empty then, and people with nine to five jobs have been watching TV for two hours now. As the time goes by in my third year I find myself addicted to making, to being, to seeing, to talking, to reading I’m hoping to get a bit more of living, when I leave university. The Translation Show is open Friday 27 November, 12.00 – 16.00. 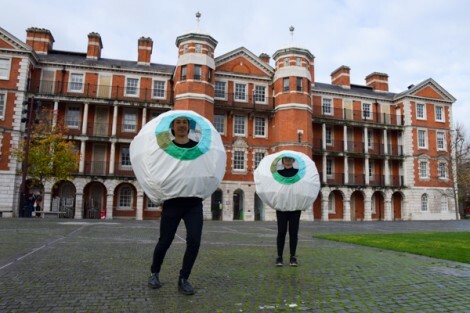 Private View is Thursday 26 November 2015, 18.00 – 20.30, by invitation only. The show will take place in the Triangle Space, Cookhouse Gallery and the Parade Ground. 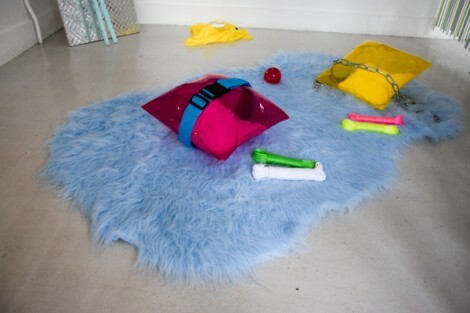 Find out more about Sasha Cresdee’s work on her Tumblr account. Find out more about Nikoleta Martjanova’s work on her Instagram account. Interested in BA Fine Art? Find out more on our course page.